.925 sterling silver jewelry,studded with gemstone. MAIN_STONE : Charoite. STYLE : Cufflinks. MATERIAL : Gemstone. OCCASION : Party. MAIN_STONE : Charoite. MATERIAL : Gemstone. STYLE : Cufflink. MAIN_STONE : Charoite. STYLE : Bullet Back. 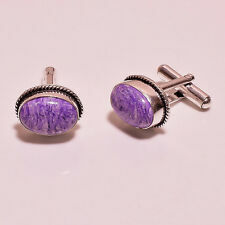 Lovely Russian Charoite Gemstone Silver Tone Cufflink 2.1"
MAIN_STONE : Charoite. MATERIAL : Gemstone. MAIN_STONE : Charoite. MATERIAL : Gemstone. MAIN_STONE_CREATION : Lab-Created. MAIN_STONE_COLOR : As Seen In Picture. MAIN_STONE : Charoite. STYLE : Cufflinks. MATERIAL : Gemstone. OCCASION : Party. MAIN_STONE_CREATION : Man-Made. MAIN_STONE_COLOR : As Seen In Picture. MAIN_STONE : Charoite. STYLE : Bullet Back. MATERIAL : Gemstone. MAIN_STONE_CREATION : Lab-Created. MAIN_STONE_COLOR : As Seen In Picture. MAIN_STONE : Charoite. MATERIAL : Gemstone. STYLE : Bullet Back.